- You can use bad boy to record both HTTP/HTTPS and save as Jmeter scripts. - Easy installation: You just copy and run the *.bat file to run JMeter. No installation needed. - Multiple testing strategy: JMeter supports many testing strategies such as Load Testing, Distributed Testing, and Functional Testing. 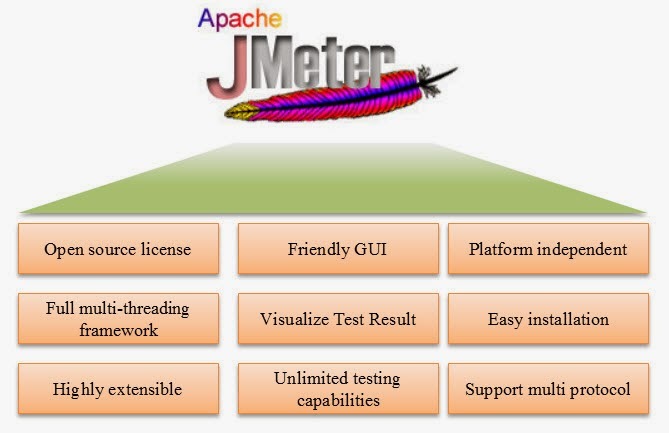 - Script Test: Jmeter can be integrated with Bean Shell & Selenium for automated testing. Why we do Performance Testing? Performance testing is done to provide stakeholders with information about their application regarding speed, stability and scalability. More importantly, performance testing uncovers what needs to be improved before the product goes to market. Without performance testing, software is likely to suffer from issues such as: running slow while several users use it simultaneously, inconsistencies across different operating systems and poor usability. Performance testing will determine whether or not their software meets speed, scalability and stability requirements under expected workload on system. Applications sent to market with poor performance metrics due to nonexistent or poor performance testing are likely to gain a bad reputation and fail to meet expected sales goals.Also, mission critical applications like space launch programs or life saving medical equipments should be performance tested to ensure that they run for a long period of time without deviations. Performance testing is a means of quality assurance (QA). It involves testing software applications to ensure they will perform well under their expected workload. close( ) WebDriver command closes the Browser window which is in focus. If there are more than one Browser window opened by the Selenium Automation, then the close( ) command will only close the Browser window which is having focus at that time. It wont close the remaining Browser windows. Where as quit( ) WebDriver command is generally used to shut down the WebDrivers instance. Hence it closes all the Browser windows that are opened by the Selenium Automation. close( ) and quit( ) work in the similar way when Selenium Automation opens only single Browser window. They differ in their functionality when there are more than one Browser windows opened by the Selenium Automation. Do we need Selenium Server for Selenium WebDriver? Selenium Server need to be run as a prerequisite for running the Selenium RC Automation tests. Why Selenium Server is required by Selenium RC ? As Selenium RC doesn't make direct calls to browser. So it requires Selenium Server as a mediator between Selenium RC tests and Browsers. So in order to run any Selenium RC Automation tests, we've to run the Selenium Server first. Is Selenium Server required by Selenium WebDriver ? Selenium Server is not required by Selenium WebDriver when we run the Selenium Automation tests on the same machine. (i.e. Browsers and Automation tests are on the same machine). Why Selenium Server is not required when the Test Browsers and Automation Tests are on the same machine ? Selenium WebDriver makes direct calls to the browser using each browser's native support for Test Automation. We use FireFox Browsers native support in our Selenium Automation code in order to run our tests on Firefox Browser. In the similar manner we use Native support of Browsers to run our tests on respective browsers. Hence Selenium Server is not required for running Selenium Web Driver Automation tests on the same machine. But, you may require Selenium Server for running Selenium WebDriver Automation tests on different machines (i.e. when the Selenium tests and Test Browsers are on different machines). This case may be possible only when implementing Selenium Grid where you have to run automation tests simultaneously on different machines to reduce time). Suppose you have 5 tests and each test takes a day to run. Then you may implement Selenium Grid to use 5 machines each running a single automation tests. Hence you will reduce the time from 5 days to 1 day. Hence, for Selenium RC we are not going to run Selenium Server as a pre-requisite when the Selenium Tests and Test Browsers are on the same machine. Stop Test : CTRL + "." For most sites, browsers will automatically include with such requests any credentials associated with the site, such as the user's session cookie, basic auth credentials, IP address, Windows domain credentials, etc. Therefore, if the user is currently authenticated to the site, the site will have no way to distinguish this from a legitimate user request. In this way, the attacker can make the victim perform actions that they didn't intend to, such as logout, purchase item, change account information, retrieve account information, or any other function provided by the vulnerable website. Sometimes, it is possible to store the CSRF attack on the vulnerable site itself. Such vulnerabilities are called Stored CSRF flaws. This can be accomplished by simply storing an IMG or IFRAME tag in a field that accepts HTML, or by a more complex cross-site scripting attack. If the attack can store a CSRF attack in the site, the severity of the attack is amplified. In particular, the likelihood is increased because the victim is more likely to view the page containing the attack than some random page on the Internet. The likelihood is also increased because the victim is sure to be authenticated to the site already. Synonyms: CSRF attacks are also known by a number of other names, including XSRF, "Sea Surf", Session Riding, Cross-Site Reference Forgery, Hostile Linking. Microsoft refers to this type of attack as a One-Click attack in their threat modeling process and many places in their online documentation. Difference between Regression and Retesting is most haunting software testing question asked in any interview by Interview and we normally get confuse between Regression testing and Re-testing. 1. Retesting is done to make sure that bug is fixed and failed functionality is working fine or not, This is kind of verification method followed in testing field for the fixed bugs. Whereas, Regression is re-execution of the test cases for unchanged part to see that unchanged functionality is working fine are not. 2. Retesting is a planned testing while Regression is know as the generic testing. 3. Retesting is only done for failed Test cases while Regression is done for passed test cases. 4. We should always keep this in mind, Re-testing has higher priority than the regression testing. But in bigger projects Retesting and Regression is done in parallel effort.But never forget importance of both in the success of the project. What is Apache HTTP Server ? Apache is the most popular Web server software. It enables a computer to host one or more websites that can be accessed over the Internet using a Web browser. The first version of Apache was released in 1995 by the Apache Group. In 1999, the Apache Group became the Apache Software Foundation, a non-profit organization that currently maintains the development of the Apache Web server software. It is an open source Web server creation, deployment and management software. Initially developed by a group of software programmers, it is now maintained by the Apache Software Foundation. Apache's popularity in the Web hosting market is largely because it is open source and free to use. Therefore, Web hosting companies can offer Apache-based Web hosting solutions at minimal costs. Other server software, such as Windows Server, requires a commercial license. Apache also supports multiple platforms, including Linux, Windows, and Macintosh operating systems. Since many Linux distributions are also open-source, the Linux/Apache combination has become the most popular Web hosting configuration. Apache can host static websites, as well as dynamic websites that use server-side scripting languages, such as PHP, Python, or Perl. Support for these and other languages is implemented through modules, or installation packages that are added to the standard Apache installation. Apache also supports other modules, which offer advanced security options, file management tools, and other features. Most Apache installations include a URL rewriting module called "mod_rewrite," which has become a common way for webmasters to create custom URLs. While the Apache Web server software is commonly referred to as just "Apache," it is technically called "Apache HTTP Server," since the software serves webpages over the HTTP protocol. When Apache is running, its process name is "httpd," which is short for "HTTP daemon."